Knowing when to leave your kids home alone is a very gradual thing and there are no definite rules on it. You just have to know your own child and what they can cope with. I started leaving my eldest on his own briefly as soon as he started secondary school. Not long afterwards, I started leaving my younger son (who was 9) with him for short periods of time. Last year, we left my eldest on his own for a weekend and we would leave my younger son, who is 15, on his own all day. But until recently, we haven’t left all three kids together. Because the kids fight. They’re like the fox, the chicken and the grain. It will usually start with my eldest having a go at my daughter. She will then shout at him. At some point, my younger son will step in and take one side or the other. If he takes his sister’s side, he is likely to get angry and throw a punch at his brother. Who will throw a punch back. Two kids on their own are fine. Three kids aren’t. We first left them alone for more than a few minutes when we went to a Christmas party in 2017. I got several texts from my daughter complaining about various things. Over the last year or so, my husband and I have started running together on a Sunday morning and leaving the kids on their own. That’s easy because they’re usually asleep the whole time we’re gone. Over half-term, I had to go into my client’s office to work. I do this once every two months and I don’t have any choice about when I go in. I go in when they need me to. As the kids are 17, 15 and nearly 13, I didn’t feel I could ask my mum to ‘look after’ them. I didn’t even tell her I wasn’t at home. I just left the kids home alone. Usually I’m home from the client’s about at 3pm, but this time it was 5. They’d been on their own since 9.30. That is a long time for three kids who fight. The good news is, they didn’t fight. 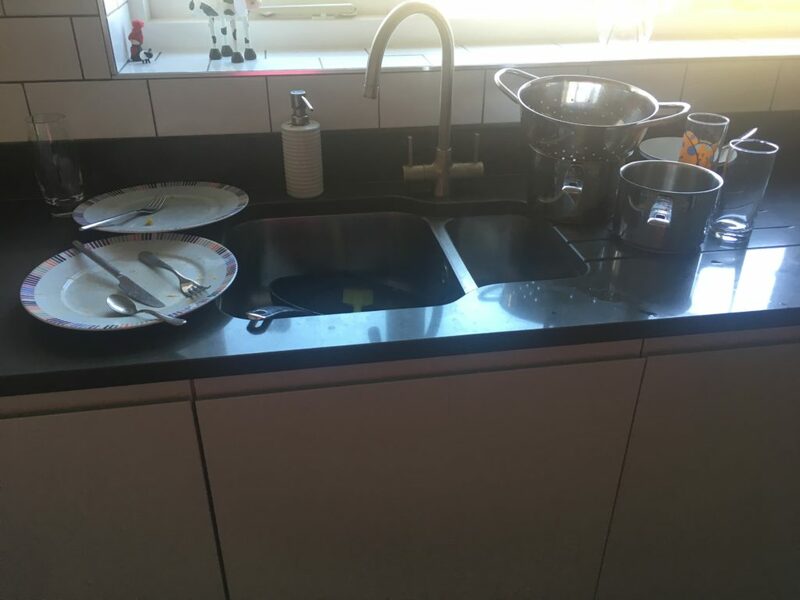 All of their dishes were left on the side, rather than put in the dishwasher, but that was OK. The only problem was that my younger son didn’t look after himself properly. He is the least competent of my kids and the one who relies most on me to provide him with food and drink. He’d had breakfast, because he always gets that for himself. But for lunch he’d had a single pitta with nothing on it. And he’d had no snacks. That is not a lot for a growing 15 year old boy to eat. Later in the day he said: ‘I think I’m a bit dehydrated’. He will sometimes get drinks for himself, but he will also often forget. He’d had just one glass of water the whole time I was out. I’m glad they survived a day without fighting, but I know it will be a long time before we leave my younger son on his own for the weekend. What age did you start leaving your kids home alone? Can they be trusted not to fight? This is really interesting, it’s something I think about a lot because it seems like such a long way off for me. But just being able to pop out and buy some bread without bundling the children into the car would be a dream. What you said about your son not getting his own drinks and food gives me a lot to think about. Lib helps herself to breakfast and drinks and can make a sandwich but Lia is very reliant on everyone else. I think I’ll at least show her how to get herself some water to get her out of the habit of always asking someone else to get things for her. It sounds like a habit that I should break as early as possible, it must be really difficult by the time they’re teenagers. Thanks for all the food for thought! Interesting. I leave my daughter 11 alone probably longest wad 4 hours, she’s very self sufficient and also just stays in the lounge or her room watching her phone! If I need to, I’m happy to nip around the back for bread leaving her with her brother, 8. 10yo he stays for no longer than 3 hours but he gets worried any longer although he’s the most aware and self sufficient of tbem all! The 3 eldest are ok together but all 4, no chance and the 8 year olds have ages to go before I can do it. That’s amazing that you can leave the 10 and 11 year olds for that long. It certainly does make life easier when you can leave them for a while. My daughter is 13, but refuses to be left on her own. She even gets upset at half an hour, so she either has to come with us or go round to my mum’s house! What an amazing feeling to be able to go out for a meal and leave them! I think it’s always best when they ignore each other. Unfortunately my eldest and my daughter argue whether I’m at home or not! Having my daughter constantly texting to say her brother is picking on her doesn’t make for a very enjoyable time. I’ve just got the one & I think he might have been about 12 when he was first home alone while I popped out. I understand about how different it is though when there’s a few of them. Maybe next time you could give your youngest some kind of reminder to get a drink etc. It is harder when there’s three of them because they really can’t be trusted! I will definitely have to remind my son to look after himself a bit better next time. I could ask one of the others to help him a bit, but they would probably just kick up a fuss and refuse! That really surprises me about your younger son. I am not sure how old they were when we started but the youngest is 9 and will be left with his 15 year old brother (and 11 year old brother). The two older ones have mobiles as well as numbers by the landline. They don’t fight as they are usually either asleep or on computer games when we go out. Mine are very good at feeding themselves (the 11 year old even cooks lunches with vegetables for us!!) but yes not so good on remembering to drink water. My younger son is generally good at eating plain carbs, while my eldest will make himself an elaborate sandwich or pasta. I’m not sure why my younger son forgot to drink! Unfortunately being bright doesn’t always equate to being able to look after yourself.